The most important component-- confidence for industry-- eased further from its highest levels post-GFC reached in December due to sharply lower expected production and increasing inventories, despite some improvement for order book levels. 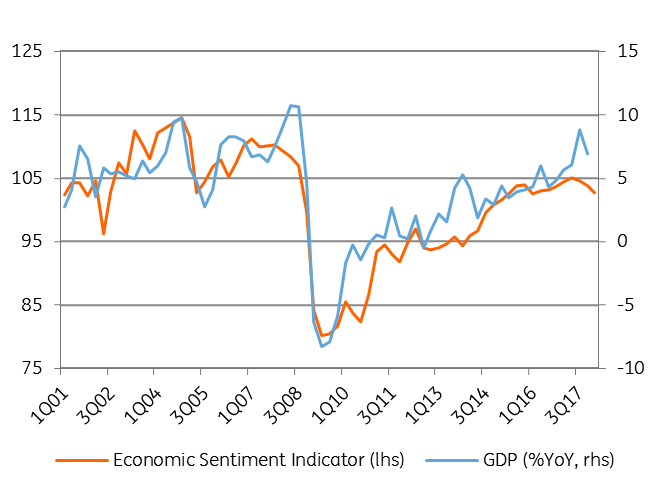 Services--the index's second most heavily-weighted component, posted an improvement in confidence driven by better than expected business over the last three months, even as expectations for the three months ahead softened. Consumer confidence declined further albeit at a slower pace amid an expected deterioration of the financial situation, negative job prospects and lower saving capacity, with a slight improvement in the general economic outlook. The recent deterioration in consumer sentiment is the result of higher interest rates, depreciation of the local currency and fiscal uncertainties. 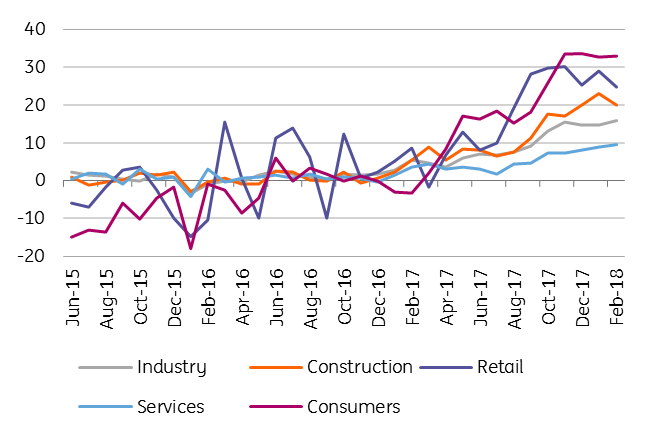 Confidence in the construction and retail sectors was also down in February with these sectors seeing a pull-back in price expectations as well, likely due to softer consumption. Nevertheless, price expectations for the other components in the ESI continued to grind higher, suggesting more to be done by the central bank to contain the inflation expectations. With soft data pointing south, the risk balance is tilted to the downside for our above-consensus GDP growth call of 4.7% for 2018 versus the 4.1% Bloomberg median. Moreover, with even more optimistic assumptions behind the state budget plan for this year, it is unlikely that public investments will offset the expected slowdown in consumption. The opposite is more likely.